It’s been nearly a year since Amalie Bruun shook the metal world with M, her debut LP, and more importantly, her formal unmasking as the black-metal phenom Myrkur. Originally framed as a spontaneous musical manifestation of the Nordic darkness, the Danish musician’s project has always been associated with liminality — an anonymous approach decried by some as a bit of PR sorcery. On M, Bruun quashed the naysayers’ accusations of gimmickry for good by channeling the project’s overarching intrigue into a crushing, meticulously crafted portrait of the sublime. She hadn’t just built a mystery — with Myrkur, she’d created a monster. Judging from the sound of Bruun’s new live album, Mausoleum, it appears all beasts can be tamed — before a sold-out crowd, natch. The collection chronicles Myrkur 2015 concert at the Emanuel Vigeland Mausoleum, which spanned her tiny catalog. As venues go, it’s pretty damn kvlt, a cavernous shrine, adorned with a series of dramatically backlit gothic murals chronicling the Rise and Fall of Man; it’s the perfect space for a leaden act like Myrkur — but Bruun hadn’t come to play metal. Instead, she took the occasion as an opportunity to isolate and celebrate the delicate beauty at the heart of all Myrkur’s rage, and more intriguingly, to expose the frail skeleton beneath the thunderous solos and overpowering effects. Upon first listen, Mausoleum might come as a shock for those accustomed to Bruun’s cacophonous sound. There are no screeching guitars, no suffocating feedback, no murky bass — just piano, acoustic guitar, and Bruun’s silphlike soprano, supported by the gentle harmonies of the Norwegian Girls choir. The stripped-down stage setup renders M’s hellish anthems sterile, even hymnal; the sorrowful harmonies of “Skogen Skulle Do” and “Den Lille Piges Dod” emit from the baby grand rather than the electric guitar, creepiness fully intact. 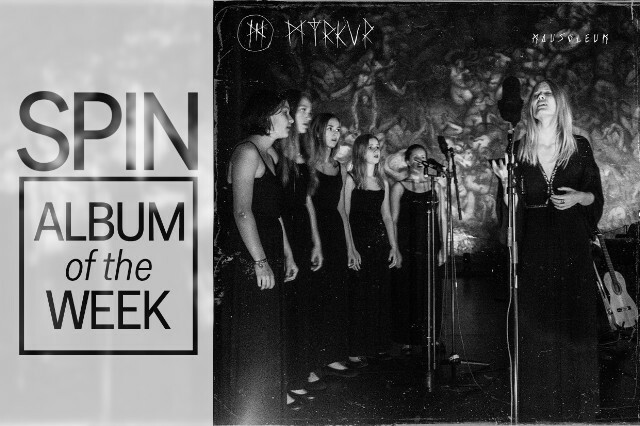 “Frosne Vindt,” a highlight off of Myrkur’s 2014 self-titled debut EP, now recalls Ulver in their similarly hushed Kveldssanger period (partially because it’s ex-Ulver guitarist Håvard Jørgensen doing the strumming, but also because the sparse arrangement brings out the song’s folky roots). Most transcendent of all is the cover of “Song to Hall Up High,” a staple of the black-metal pioneers Bathory; listening to the angelic interplay between Bruun and her choral companions, you’d have a hard time believing the original song was composed by a bunch of Satanist provocateurs. Aside from a new perspective on Myrkur’s music, Mausoleum provides a welcome diversion from the general praxis of live albums as we know them. Where most concert albums see artists recreating their material as originally recorded — albeit with enhanced energy, special guests, or covers — this release gives us an intimate look at one artist’s battle against her own canon. It’s a war she ends up winning, with considerable grace.